Find the City Clerk's official list of candidates and their campaign spending here. More sweet links after the jump. 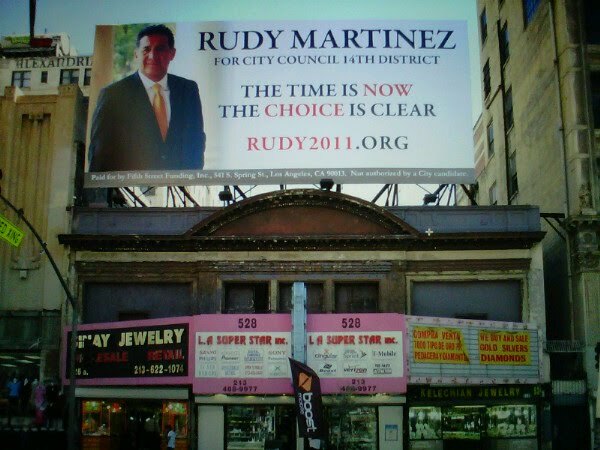 The "Mayor" seems most enraptured by District 14 candidate and reality star Rudy Martinez, who could nab the seat from incumbent Jose Huizar on charm and billboard muscle alone. (A nice hunk of independent wealth might help as well.) The Weekly announced his glamorous candidacy back in October. On another amusing note, City District 4 candidate Frank Sheffel (in the picture above) owns the Candy Factory in North Hollywood, a custom-sugar Mecca for the stars. So far, he's reported no campaign expenditures. Chocolate-carving not quite holding up to the recession, there, Sheffel? The LA Daily News gives a rough summary of incumbents and their challengers. Not that anything as active as "challenging" is really going on here. As a general rule of thumb, the candidates who spend the most money are more than likely to come out ahead. "The Los Angeles City Council has one 'open' seat - with no incumbent seeking re-election - of the seven districts on the ballot. In the 12th District in the northwest San Fernando Valley, incumbent Councilman Greig Smith decided against running for a third term, and a field of seven candidates is seeking to replace him. The four-year term pays an annual salary of $178,789. The most well-funded candidate seeking to replace Smith is his chief of staff, Mitch Englander, who has raised more than $400,000." The Daily News also ran a specific list of procrastinators. That is, candidates who twiddled their thumbs until last weekend, when they finally filed for candidacy. Could they be the same ones who'll wait until the very last day to approve rushed ballot items that determine the destiny of the city?